Ever thought about studying a bit of programming? Thought it was a too daunting task? I’ve just gone through the second lesson on learnstreet and it’s quite fun! It doesn’t take long to go through the first two lessons, so if you don’t have much time you can spend a few minutes each day going to the next exercise or lesson. Only other language I’ve studied is C++ back in high school – it did not sit so well with me back then. Since then I’ve made acquaintance with Ruby, Python and Perl, but never made it too far away from bash. Why start with Python then? I’ve seen announcements of vulnerabilities for Ruby lately, Perl isn’t on learnstreet and Python is used in some scripts at work. This entry was posted in IT and tagged programming, python, studying on 2013/01/14 by guldmyr. Disks: Intel i300 SSD, 2x500GB and 1x3TB Western Digital Drives. grub2 does not like keyboard, but if I boot on the Ultimate Boot CD (grub) – the keyboard does work. This is with flipping all the USB keyboard, mouse, storage, legacy .. settings on and off in BIOS. After removing Ubuntu 12.10 and installing 12.04 (this is with USB things enabled in BIOS) – the keyboard works in grub2 menu. to install better drivers, easiest is to open Ubuntu Software, edit sources and allow post-release things. If you do decide to try with newer drivers for the ATI – card, make sure you have the installation CD/DVD handy. Or even better, get it on a USB-drive, way faster. # above xhost is to get x things working from within a chroot (possibly unsafe?). You also need to make sure zen and mediainfo works – check trace log in UMS to see if there are any errors in the beginning that they are not found. If so the hack is to create symlinks. For me the libzen.so and libmediainfo.so are in the /usr/lib/x86_64-linux-gnu/ directory. One reason was that I wanted to learn more about this tool – but another reason is that it’s quite light weight, especially if you’re going to be running an httpd anyway. # Script to monitor temp and fanspeed of an AMD/ATI card. # amdccle required? Also X? echo "Cannot find aticonfig, check paths and if it's even installed." Would be good to install collectl and just export to graphite. But this does not work well currently because the version of collectl with Ubuntu 12.04 LTS is 3.6.0 (3.6.3 with 12.10). 3.6.1 is needed to make it work with graphite and 3.6.5 to make it work good if you want to group servers. There are plenty of other options though. You can write some scripts yourself, use diamond or a few other tools that has graphite-support. Diamond is another option, to install follow these two links https://github.com/BrightcoveOS/Diamond/wiki/Installation (only addition is first you have to clone the git repository, from in there you run make builddeb). This entry was posted in IT and tagged desktop, install, Linux, operating system, tips, Ubuntu on 2012/12/15 by guldmyr. This a software to run commands on a set of servers. For example ‘pdsh -a uname -av’ will give you “uname -av” of all machines. after that you can immediately run “pdsh -w oss1,client1 uname -av” to run a command on a remote node. It’s possible to set up so that it executes on a pre-defined list. Check out /etc/machines. This entry was posted in IT and tagged distributed shell, hpc, pdsh, rpmforge, shell on 2012/11/10 by guldmyr. Enabled! Wonder if there’s been lots of exploits for this method of writing posts? Turns out there are lots of old exploits for wordpress and xmlrpc, apparently it may also leave the page open for bruteforce attacks.. I’ll leave this one disabled. But I bet there are other ways to upload posts. E-mail perhaps. But it’s actually working pretty well with google chrome — at least it’s a lot smoother than the native android browser. This entry was posted in IT and tagged android, blogging, wordpress on 2012/09/17 by guldmyr. This entry was posted in IT and tagged brocade, picture on 2012/09/14 by guldmyr. Just got one of these – thought it would be a great tool when going to conferences for example or somewhere where I would need a small computer but don’t want to bring a long my normal heavy laptop. Normally I prefer pen and paper when going to meetings or conferences, but if there’s a lot of information needed to be written down or if I want to check something online it sounds quite nice. Got a keyboard with it too. The stuff I’ve wanted do to so far works perfectly and it is very nice to play around with – though I haven’t done any serious work or task for any longer period of time yet. If I can do that without any/much issues I will be very happy about it. Rooted it without any problems (from a Windows 7 x64 PC). Needed to install the USB drivers from Asus’s page – (choose OS android). It would also be nice to have a Linux chroot terminal running inside Android. This tutorial works pretty great – at least to get a basic setup :) Still need to play some more with it to get things working (vpn perhaps?). After you got the sshd running on the android you can connect to localhost with an ssh client, for example irssi connectbot. In there you run the commands outlined in the last link. After you create a user you need to add the user to the appropriate group. At least if you want network access. What was strange was that if my user was in only aid_inet I could ssh and irssi to an IP-address, but I could not ping said address. Neither could I ping or ssh to a dns-name. After adding group aid_net_raw and your user to that group that was possible. After that you can use ‘pacman -S irssi’ to install for example irssi! This entry was posted in IT and tagged android, arch, asus, Asus Eee Pad, asus transformer, chroot, Linux, tf101 on 2012/09/05 by guldmyr. This accrediation has the most questions of all the current ones, but it has the same amount of time allotted (one hour) so this exam will have a lot less time available for each question. The curriculum for this accreditation are also free, they are called Introduction to HBA and Introduction to CNA. There’s also some docs about the 1860 Fibre Adapter. They can be found on Brocade’s Saba/training website under my.brocade.com. // Update 20140422: This accrediation has been replaced with something else. See the current list here: http://www.brocade.com/education/certification-accreditation/index.page? 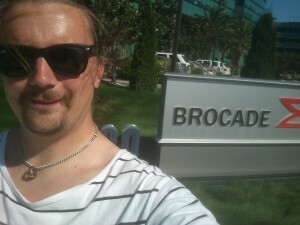 This entry was posted in IT and tagged accreditation, basp, brocade, certification, certified, fc, fibre channel, SAN, san storage, Storage, storage area network, Study on 2012/08/18 by guldmyr. After some time the solution I devised on http://www.guldmyr.com/blog/script-to-check-for-an-update-on-a-web-page/ just did not elegant enough (also it stopped working). I suspect that the repository itself could be used to see if there’s an update to it. It has all these nice looking files in here: http://repository.spotify.com/dists/stable/ – but I also suspect this is a repository for debian/ubuntu which I cannot use on my RHEL-based workstation. A bash script was written. It uploads the spot.xml whenever there is an update. The script does not run on the web-server so it ftps the file to the web-server, it would be nice if it did because then the actual updating of the feed would be so much more simple (just move/copy a file). But, I hope it works :) Guess we’ll see next time there’s an update to spotify! Or, more easily, you can just add http://guldmyr.com/spotify/spot.xml to your RSS reader (google’s reader, mozilla’s thunderbird, there are many of them). Latest post in an RSS feed is just below the header, making it a bit awkward to update via a script as you cannot just remove the </channel> and </rss>, add a new <item></item> and then add the </channel> and </rss> at the end again. lastBuildDate in the header also needs to be updated each time the feed is updated. In the end I decided to re-create the file/feed completely every time there was an update. Some rss-readers appear to have a built-in interval that they use to check if there’s an update. So for example you could update the rss-feed and press ‘refresh’ but the client still won’t show the new feeds. Google Reader does this for example. With Mozilla’s Thunderbird you can ask it to update (Get Messages) and it will. You don’t need an e-mail account in Thunderbird to use it as an RSS reader by the way. http://feedvalidator.org is a great tool, use it. I claim no responsibility if you actually use the script, the feed however should be fairly safe to subscribe to. This entry was posted in IT and tagged bash, feed, ftp, Linux, repository, RSS, rss feed, script, spotify, web on 2012/07/08 by guldmyr. This entry was posted in IT and tagged certification, Linux, red hat, rhce, Study on 2012/07/02 by guldmyr. In a previous post while preparing for RHCSA I installed kvm post-installation, via the GUI. But how to install, configure and use it only from the CLI? As a test-machine I’m using a server with Scientific Linux 6.2 (with virtualization enabled as seen by ‘cat /proc/cpuinfo|grep vmx’). or correspondingly to get more information about the group. yum groupinstall Virtualization "Virtualization Tools" "Virtualization Platform" "Virtualization Client"
This installs a lot of things. Libvirt, virt-manager, qemu, gnome and python things. This also sets up a bridge-interface (virbr0). Now, how to install a machine or connect to the hypervisor? Then start virt-manager and connect to your server. However this didn’t work for me either. Is virtualization needed on the client too? If it says that you’ll need to go into BIOS / Processor Options / and enable Virtualization. Then you can start virt-manager, check that you can connect to the KVMserver. Copy a .iso to /var/lib/libvirt/images on the server. Re-connect to the kvm-server in virt-manager. Add a new VM called test. Using 6.2 net-install and NAT network interface. This may take a while. Pointing the VM to kvm-server where a httpd is running (remember firewall rules) and an SL 6.2 is stored. Installing a Basic Server. OK, we could use virt-manager, it’s quite straight-forward and doesn’t require any edits of config files at all. To install a vm you use ‘virt-install’. This can become quite a bit more complicated. You would probably want to make clones (virt-clone) or snapshots (virsh help snapshot) instead of using the same disk file. Making your own .xml from scratch looks fairly complicated. You could use ‘virt-install’ however. For this the console actually works while running ‘virt-install’ over ssh on the kvm-server. This entry was posted in IT and tagged certification, kvm, libvirt, libvirtd, Linux, qemu, red hat, rhce, scientific linux, studying, virtualization on 2012/06/16 by guldmyr. In case you saw my previous posts I’ve been prepping for a RHCE course the last couple of weeks. Odds are quite high that I’ve missed something or not gone deep enough into some subjects and for the record some subjects I decided to skip. I’m taking the course over at Tieturi here in Helsinki and they have published the schedule for the course, with quite detailed outline. This outline of the course can with benefit be used to see if you missed any terms or functions while going through the objectives. Beware that this is unsecure. Very unsecure. You should at least set up a password for the proxy, change the default port and have as limited firewall rules as possible. Symmetric uses a secret/password to encrypt and decrypt a message. There are many more things you can specify. Uses a key-pair. A public key and a private key. A message encrypted with the public key can only be decrypted with the private key. A message encrypted with the private key can only be decrypted with the public key. GnuPG can let you handle this. gpg --armor --output "key.txt" --export "labber"
However, how to encrypt a file with somebody else’s public key? A certificate has user details and the public key. Basically a way to authenticate users. You can put different types of authentication ways behind PAM. So that a software only needs to learn to authenticate to PAM and then PAM takes care of the behind-the-scenes-work. For example you can have PAM connect to an ldap-server. This entry was posted in IT and tagged authconfig, centos, certification, encryption, firewall, gnupg, gpg, http-proxy, iptables, ipv6, ldap, Linux, masquerade, nat, openssl, pam, pki, proxy, red hat, rhce, routing, squid, ssh-keygen, sssd, studying, web-proxy on 2012/06/13 by guldmyr. You could possibly test this from Windows as well. On linux it’s fairly straight-forward, you can use ntpd both as a client and as a server. The time-synchronization with ntpd is slow by design (to not overload or cause dramatic changes in the time set). ntpdate is instant but it’s not recommended to be used. For example with ‘ntpdate -q’. You only need to add one server line but for redundancy you should probably have more than one. As an example with your client on 192.168.0.0/24 and server is on 192.168.1.0/24. You need to add a restrict line in ntp.conf. You also need to allow port 123 UDP in the firewall. Basically the same as the above for client, but you specify the address to your NTP-server instead of one from pool.ntp.org. I believe this has been covered. One extra thing you may want to check out is the ‘tinker’ command. This is put on top of ntp.conf and more info are available in ‘man ntp_misc’. However, most of the time you just need to wait a bit for the time change to come through. There’s not much to go in logs on either server or client for ntpd. You’ll get messages in /var/log/messages though that says “synchronized” and when the service is starting. You can also use tcpdump on the server to see if there are any packets coming in. Start with the server still connecting to an ntp-server with good time. You could then set the date and time manually on the server to something else. For example, let’s say the current time is 6 JUN 2012 17:15:00.
date -s "6 JUN 2012 17:00:00"
Also restart ntpd on the client, then wait, this will probably take a bit longer than before. This entry was posted in IT and tagged centos, certification, file transfer, Linux, ntp, ntpd, ntpq, red hat, rhce, studying, synchronization, tcpdump, time, time sync, time synchronizatino on 2012/06/08 by guldmyr. To test from windows you can use putty. But in linux you just need ssh for client and sshd for server. man 5 sshd_config and this blogpost has an overview. The last row sends a special message to a client connecting from a non-allowed network. If you on the server with these settings try to do “ssh -v root@localhost” or “ssh -v root@192.168.1.1” you’ll get the message from twist. You can log on to the localhost, but not if you add “LOCAL”. you can log on from localhost to the public IP of the server. This entry was posted in IT and tagged centos, certification, file transfer, Linux, openssh, red hat, rhce, ssh, sshd, studying, tcp wrapper on 2012/06/06 by guldmyr. Hackmode has a good article about setting postfix for the first time. To test that e-mail is working you can – tada – use an e-mail client. The . at the end is quite nice, that stops the input. But, perhaps you want to check this out with a real e-mail client like thunderbird 10. For this there needs to be a e-mail server that stores the e-mails on the server. Thunderbird is quite nice, it will often tell you which setting is wrong. You can use /var/log/maillog for details on the server-side (to see if you get connections at all for example). You need to send an e-mail to the e-mail address before you can add it in Thunderbird (because the user does not have a $HOME/Maildir until you do). If I understand this correctly to setup the above two we would need to have two servers. This entry was posted in IT and tagged centos, certification, dovecot, file transfer, imap, Linux, postfix, red hat, rhce, sendmail, smtp, studying on 2012/06/04 by guldmyr. This entry was posted in IT and tagged das, nas, performance, postgresql, SAN, Storage on 2012/05/29 by guldmyr. Testing an SMB server may be quite easy from Windows, but from Linux I suppose it’s a bit trickier. testparm is another tool you can use to test that the config file – smb.conf – is not missing anything structural or in syntax. The server is called ‘samba’. server#: check that ‘security = user’ in smb.conf. connect with another user – can you do things? This entry was posted in IT and tagged centos, certification, file transfer, Linux, red hat, rhce, samba, smb, studying on 2012/05/14 by guldmyr. Testing an NFS server is generally easier from another linux-server. With the help of permissions. Use unix group ID number or names. This entry was posted in IT and tagged centos, certification, file transfer, Linux, nfs, red hat, rhce, studying on 2012/05/14 by guldmyr. An ftp-server is also quite easy to test. You can test it from many web-browsers, telnet, ftp, lftp or a myriad of other clients. This entry was posted in IT and tagged centos, certification, file transfer, ftp, Linux, red hat, rhce, studying on 2012/05/12 by guldmyr. Looks like you can do lots of fun stuff here in case you get a stalled system. This entry was posted in IT and tagged Linux, operating system, os on 2012/05/03 by guldmyr.